Above: Makin’ moves: Brooks Thostenson and Kyle Hawari, the buddies behind the snack bars packed with Taos Mountain energy and spirit. IN THE WINTER of 2010, more than 200 inches of snow dumped on Taos Ski Valley, and Kyle Hawari and Brooks Thostenson, twentysomething buddies from Texas, didn’t waste a flake: They rocked an impressive 90 days on the slopes that season. In the next year, they launched Taos Mountain Energy Bars, and success started coming as fast and steep as the slopes that inspired them. By 2015 they were selling 100,000 bars a month and racking up more than $3 million in sales in more than 1,500 locations nationwide. When the company opens a new production facility in Questa this spring, it will mark another landmark step. It will allow them to add another 15 employees to their operation, for a total of 30, and set their sights on annual sales of up to $50 million. That’s a lot of energy bars. Friends since third grade, Thostenson and Hawari had discussed starting a business together as kids, but they went their separate ways after high school. Thostenson graduated from Southern Methodist University and cut his teeth selling life insurance in Dallas. Hawari’s career at Yale was interrupted by a severe knee injury his sophomore year; his search for a place to mend landed him in Taos, working at a coffee shop, biking, and taking physical therapy. Back at Yale a year later, Taos was still on his mind. He returned during the winter of 2009–10 and invited Thostenson to join him. They resumed their childhood conversation. They envisioned a product that could meet the needs of a serious mountaineer like the legendary Everest guide and Taos ski patroller Dave Hahn. He says that when an athlete is under serious physical exertion in high, cold places, the appetite for dull food evaporates into the frigid wind. It’s hard to eat, yet you need to put fuel into your body. “That’s what we wanted,” says Hawari: “a fundamentally different snack for outdoor athletes, inspired by the outdoors. It had to be created in a kitchen, not concocted in a lab. It had to taste good, provide a lot of energy, and reflect that ethos we found in Taos, both for quality ingredients and creativity. By May 2011, the budding entrepreneurs had cooked up four bars that met their criteria: Hawari’s number one, the firm and somewhat savory Caramel Pecan; a Chocolate Butterscotch bar made with quinoa, peanut butter, flax, chia, and vanilla; the sweet and salty Toasted Coconut, which proved Thostenson’s favorite; and the soft and subtle Almond Agave bar. They launched from the community kitchen at Taos County Economic Development Corporation. 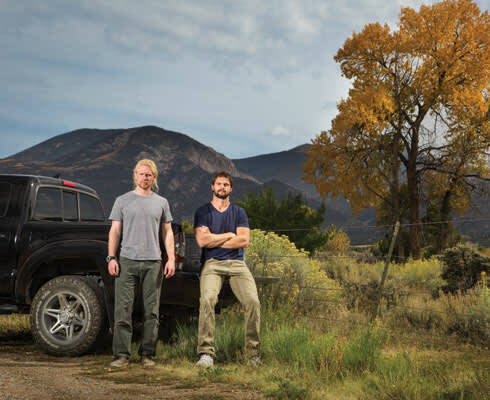 At first, Thostenson and Hawari kept working their night jobs, but it wasn’t too long before they were making the 90-minute drive to Santa Fe to sell bars from the back of their car. In the evenings they were on their phones talking with retailers. In early 2013 they rented a warehouse in Taos, installed a commercial kitchen, and got their permits square with the state. Once they were able to delegate the production side of the operation, the two ski bums turned businessmen focused on sales and distribution, learning by doing. The choice to locate their new production facility—funded with the help of a $437,000 grant from the New Mexico Local Economic Development Act—in the new Questa Industrial Park jibes with Thostenson and Hawari’s vision of employing locals in a small town that needs jobs. It also fits the brand. Questa, just north of Taos, is the gateway to a vast array of protected public lands. From the snow-crowned Wheeler Peak, Latir Peak, and Columbine Hondo Wilderness areas to the Rio Grande del Norte National Monument, this part of northern New Mexico is a high-altitude bastion of outdoor recreation. Dave Hahn liked the operation enough to join its Pro Team of extreme athletes who serve as the company’s ambassadors to the outdoor adventure community.